Over the past few years the “stop-and-frisk” program in NYC has come under significant scrutiny for unlawfully targeting minorities. The city is currently reforming the program. We are interested in determining what the data can tell us about where and how the program can be improved. How has the program been scaled back since Mayor de Blasio’s reform policies? How effective is the Stop, Question, and Frisk policy in finding contraband in NYC neighborhoods? Have the reforms affected the disparity between the racial demographics of NYC and the racial demographics of the people stopped? 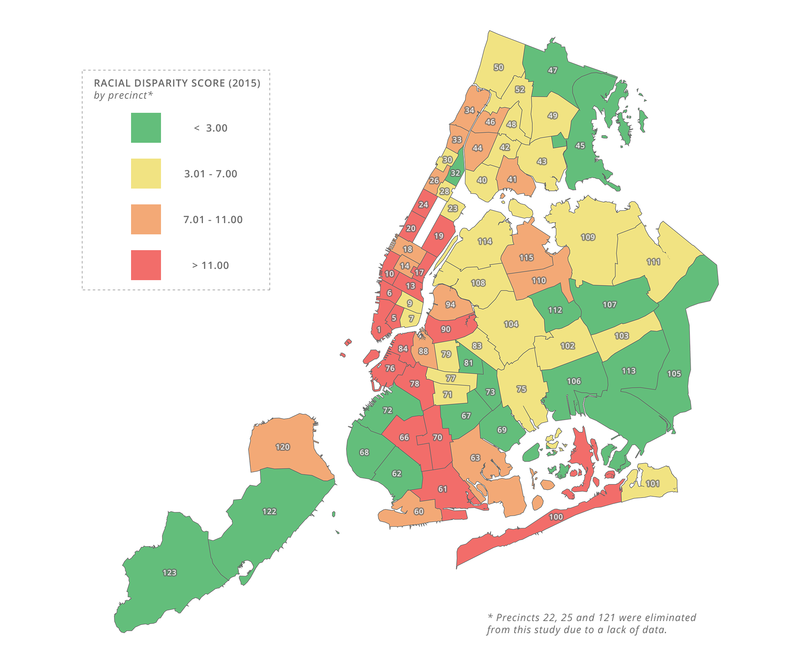 Which NYC precincts have the greatest racial disparity? Our hypothesis is that since the increased scrutiny and reform of the program beginning in 2013, the number of stops made has decreased, while the effectiveness of the program to discover contraband has remained stagnant. Every time a police officer stops a person in NYC, the officer is supposed to fill out a form to record the details of the stop. The NYPD reports the stop-and-frisk data in two ways: a paper report released quarterly and an electronic database released annually. We combined this data with demographic US census data to develop our model. The data includes the race and location of the person stopped, if the person was frisked, and if there was a weapon or firearm recovered. To measure the disparity between the racial demographics of NYC and the people stopped, we developed a Racial Disparity Index. The RDI measures when races and ethnicities are more regularly targeted for Stops, Questions, and Frisks than would be warranted by the demographic makeup of a community at the city level and precinct level. The number of stops began to significantly decrease starting in 2012 due to public scrutiny and eventually due to reforms. Even as the number of stops decreased over time, the percentage of contraband discovered per stop increased, showing signs of improvement in regards to effectiveness, and that our hypothesis was incorrect. This is further discussed here. The disparity in stops between the racial makeup of the community and the racial makeup of the stop-and-frisk incidents within that community increased over time. Exact causes are undetermined. On this map we display the Racial Disparity Index levels for each precinct.